Ever heard of batik fabric? 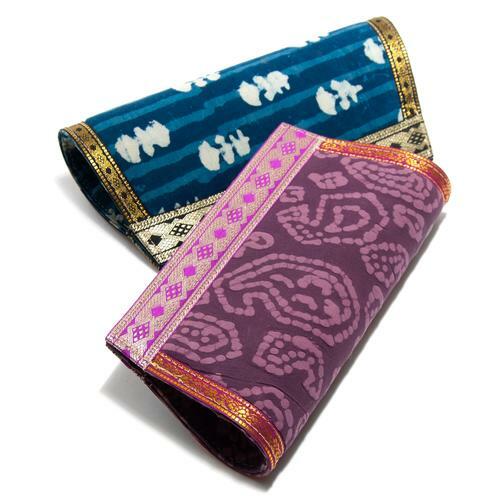 Here at Global Goods Partners we are selling these beautiful Indian Clutch Bags, which have been hand-batiked by women in India. One would think that the designs on the fabric were difficult to create; yet the process of batiking fabric is surprisingly easy and super interesting! Batik is the art of decorating cloth using wax and dye. It has been practiced for centuries, originating on the island of Java in Indonesia. The process of batiking fabric has since spread to all areas of the globe, yet Java is still home to some of the world’s finest batik products. Interestingly, the word batik actually comes from the Javanese word tik, simply meaning “to dot”. The process of making batik fabric includes pouring hot wax over the fabric in a particular design or pattern, and then dyeing the fabric over the wax. Once the wax dries, it resists the dye so that once the wax is removed, the original colour of the fabric is retained in that spot. This allows for an array of beautiful and interesting patterns and designs to be created. Several layers of dye and wax can be used to created intricate details on the fabric, which make for eye-catching products like our new Indian Clutch Bags. Contemporary batik differs quite a lot from its traditional predecessors. Nowadays, batik is often created using stencils and waxes of varying degrees of resistance. Additionally, materials such as leather, cotton and even wood can be batiked. In conjunction with our partner, the Community Friendly Movement, these clutches were hand-batiked by women in New Delhi, India. Women all over India are boosting their communities by batiking fabric, like 15 year old Shona, who batiks in her free time. If you’re interested in creating your own batik fabric, follow these 10 easy steps!